An article on Forbes.com, written by David Kroll, caught my attention. First, it was and still is, Cannabis. Now, it’s another plant. A natural medicine – not artificially-produced, addictive, pain killers and human killers, known as “opioids,” by Big Pharma. 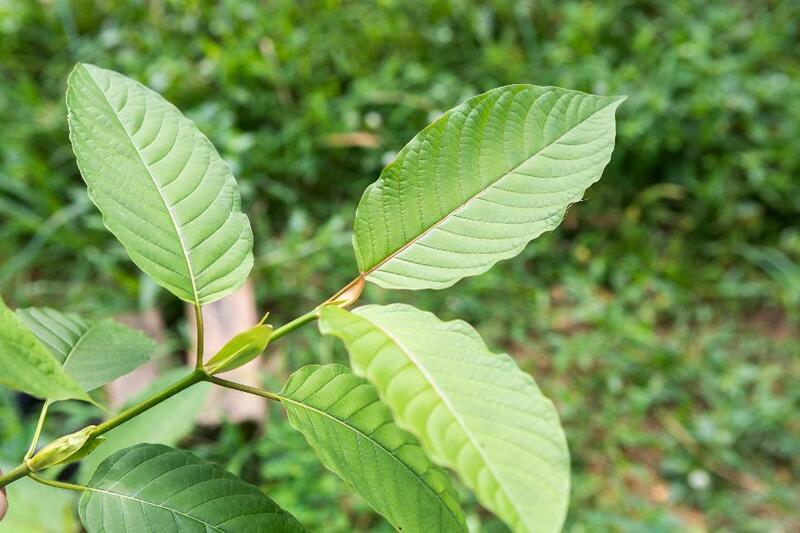 The U.S. Drug Enforcement Agency has filed a notice of intent (PDF) to place the southeast Asian plant called kratom to the most restrictive classification of the Controlled Substances Act. The plant, Mitragyna speciosa, and its two primary constituents, mitragynine and 7-hydroxymitragynine, will be temporarily placed onto Schedule I on September 30, according to a filing by the DEA today. Thank the CDC (Centers for Disease Control and Prevention – Its main goal is to protect public health and safety through the control and prevention of disease, injury, and disability) for “protecting public health” in this case; (as in the case of Cannabis – Marijuana) as well. Last month, the CDC came out with a report that kratom “can be abused and that poison control centers have received over 660 calls between 2010 and 2015 regarding kratom intoxication.” The report stated the plant kratom, had a “stimulant effect” and was “an opioid substitute.” Opioids are suppressants. How can kratom be an “opioid substitute” when it has a “stimulant effect”? How can a plant be an opioid substitute when it actually lessens the effect of an opioid? The plant lessens the dependency on opioids. For 173 (26.2%) exposure calls, no effects were reported, or poison center staff members were unable to follow up again regarding effects. One death was reported in a person who was exposed to the medications paroxetine (an antidepressant) and lamotrigine (an anticonvulsant and mood stabilizer) in addition to kratom. The Drug Enforcement Administration includes kratom on its Drugs of Concern list (substances that are not currently regulated by the Controlled Substances Act, but that pose risks to persons who abuse them), and the National Institute of Drug Abuse has identified kratom as an emerging drug of abuse. Among calls reporting use of kratom in combination with other substances (multiple exposures), the most commonly reported other substances were ethanol, other botanicals, benzodiazepines, narcotics, and acetaminophen. Aspirin is a drug that could be abused; Tylenol (acetaminophen), Naproxen and Ibuprofen are drugs that could be abused. Anything taken in huge doses, which are now “safe drugs” could turn into abusive drugs. If a person’s intent is to inflict harm, it can be accomplished. Kratom use appears to be increasing in the United States, and the reported medical outcomes and health effects suggest an emerging public health threat. Members of the public and health care providers should be aware that the use of kratom can lead to severe adverse effects, especially when consumed in combination with alcohol or other drugs. The CDC report was based on 660 reports between 2010 and 2015 across the 50 states; more than half of which showed no harm or very little harm to those who consumed kratom. I believe this is going “a little” overboard. It is plain to me that the DEA and CDC are doing everything they can, to protect Big Pharma, even when it makes sense to only the DEA and CDC, for which we, with our tax dollars, are paying through the nose. Again. Yet. Still. I believe Gene Wilder touched his fans in a way that was special and individual to each one. A great character. The Debate Schedule May Be Debatable. The first of three primetime presidential debates between Hillary Clinton and Donald Trump is scheduled for Sept. 26 at Hofstra University in New York. The other two debates are scheduled for Oct. 9 at Washington University in St. Louis, and Oct. 19 at the University of Nevada, Las Vegas. All three debates will take place from 9 p.m. to 10:30 p.m. Eastern. But whether the debates will actually happen remains to be seen. Trump, who skipped a debate in January during the Republican primaries and instead held a rally for veterans that he said raised $6 million, has again threatened to boycott the debates. “I want to debate very badly. But I have to see the conditions,” Trump told Time earlier this month, although the debate schedule was set almost a year ago. I’m writing to tell you that I strongly oppose the Roberts-Stabenow compromise language on the GMO labeling bill. I ask that YOU also oppose it. This legislation would overrule Vermont’s consumer-friendly GMO labeling law, and prevent states from passing similar laws, and would create a confusing, misleading and unenforceable national standard for labeling GMOs. Instead of a uniform labeling standard like Vermont’s law, the language allows text, symbols, or an electronic code to be used. This is intentionally confusing to consumers, and the information may be entirely inaccessible if the consumer does not have access to the internet. Perhaps most shockingly, this bill imposes no penalties whatsoever for violating the labeling requirement, making the law essentially meaningless. Thus, this is a weak bill, full of loopholes, without any requirement to comply. A law is meaningless and harmful if there are no penalties for not adhering to its requirements. 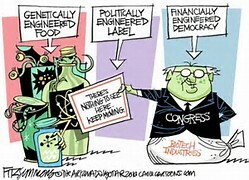 Are our Senators and Representatives so weak, that they are willing to have themselves and their families and children and friends eat food that may not be safe, in order to submit to the BIG CORPORATION LOBBYISTS? The overwhelming majority of Americans favor GMO labeling. People have a right to know what is in the food they eat. The Senate shouldn’t stop states from passing laws that let that happen. Please oppose the Roberts-Stabenow GMO labeling bill. HERE AGAIN, WE HAVE LAWS PASSED WITHOUT REPRESENTATION OF THE MAJORITY. Remember the Boston Tea Party? Why did the patriots dump the tea into Boston Harbor? Because we were being taxed without representation in Britain. The Congress passes too many bills into law without the majority of the citizens’ desires in mind. The seats that Congress occupies on Capitol Hill can be filled with other individuals who are more willing to vote in favor of what the citizenry wishes. This is a time of political upheaval. More voters will be voting in this upcoming presidential and congressional election than in any other election. There are a greater number of registered voters who have left the two major parties or registered Independent or are just totally confused as to which candidate for whom to vote. This is the first time I am writing to you. I can’t imagine how difficult it is for you to be wrestling with the Afghan dilemma, but I am sure you must be suffering greatly under the burden of making a decision that will affect every American citizen all around the world for years to come. I am suffering also. About the lives lost, the lives maimed and lives laid barren with the loss of loved ones. It tears my heart and many times I am close to crying for every one of them. And for what? Shades of Viet Nam shadow my horizon of the future. Details of that are not necessary to outline in this letter. That is in the past. So, let’s leave it there. General McChrystal is probably right in his assessment of the military requirements to heighten the effects of intervention on behalf of the Afghan people. In the 8 years that troops have been deployed there, how much has been accomplished? To me, that is the bottom line, and this question posed has, in my opinion, only one answer: Accomplishment has been in the negative. (6) All the US Dollars that have been spent during the Bush years and this year just ending of the Obama years, could have been used to prop up our own economy which needs so much help. Must we keep spending more to see it go for naught, in my opinion? If I took more time right now, to think further, I’m sure I could come up with more reasons for us not being in Afghanistan. The Russians found plenty of reasons for leaving. I hope you will take my few thoughts to heart and mind, while you continue to mull over the Afghanistan problem. My “bottom line” is: Leave! I would say that if I sent this letter today, it would still be current. What say you? I always look out the bedroom window to see what kind of a day it is and perhaps a sign of what kind of a day it will turn out to be. 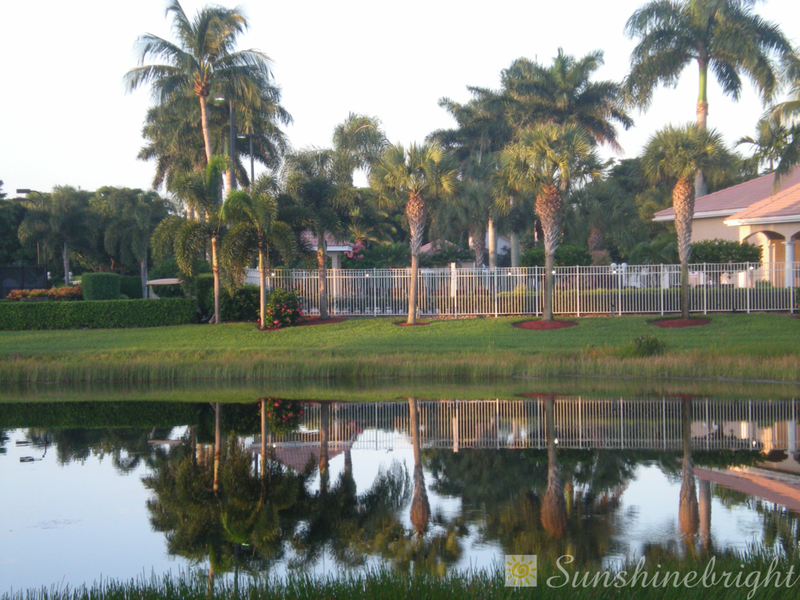 This morning, my view was of stillness. Not a minuscule of palm fronds shifted. The lake was quiet – not a hint of a breeze kissed it. Will Private Prisons Become A Thing Of The Past? What Will The Companies’ Future Hold? This announcement is welcomed to both inmates and private citizens; as a private citizen, I have been suspicious about private prison operators running the prisons – even though only 12 percent (13 facilities) of our prisons are being run by “for profit” companies. I’m sure most would agree. The Washington Post article by Matt Zapotosky covers the “mechanics” of how and when the private prisons will be phased out. It has taken a long time for the federal Bureau of Prisons to figure out that it is not a good situation when you have profit-oriented contractors controlling some of the huge prison populations we have in the United States. Another Washington Post article by Michael Cohen, published on April 28, 2015, covers the subject of how for-profit prisons had developed a very strong lobby in Congress: a subject which is not widely known about by John Q. Public. As of June 2012, there were 130 private prisons, half owned by Corrections Corporation of America, and the other half, by The GEO Group, Inc. Evidently, there has been a whittling down of the numbers – big time – and the Justice Department has seen fit now, to end them altogether. President Obama has made a slight dent into the inmate population by pardoning hundreds who have been given sentences that far outweigh the size of the crime. But, when the private prison industry is gone, I hope our sentenced offenders, still serving time, will get better, safer treatment under the watch of the federal government and not under the scrutiny of money-hungry and influence-peddling businesses. The private prison industry is fighting back. Take a look at this page on the Justice Policy Institute’s web site. Halfway houses, electronic monitoring, and health care. It is possible to have inmates committed into hospitals where they could stay for life, when prison terms are completed. This is an outrageous theory, but these companies are thinking of all the ways they can stuff their pockets at the expense of others. There is no stopping the foaming-at-the-mouth intensity for more money of these for-profit companies who are very willing to prey upon the unlucky and down-and-out of our society. 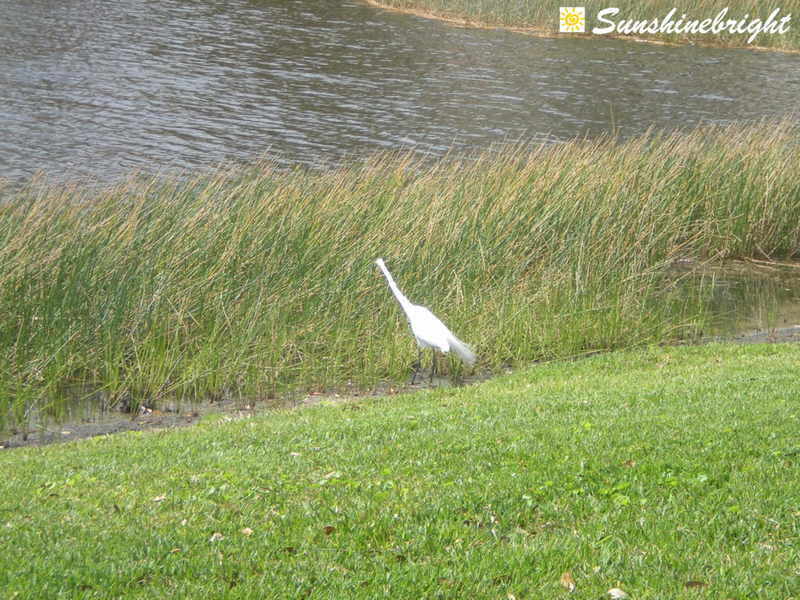 It was a windy day, a few months ago (probably March – even in South Florida, we get lots of wind during that month), and I caught up with that elegant bird via camera. To enlarge the photos, click on them. 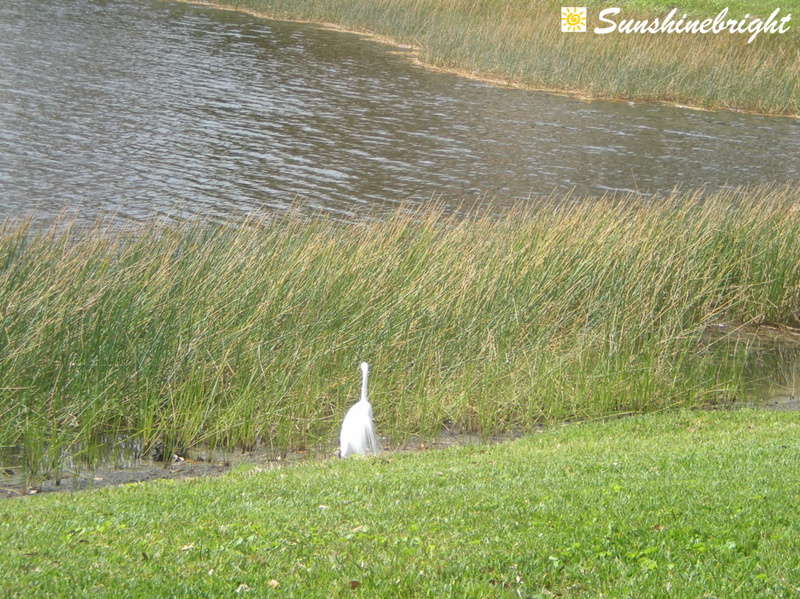 Normally, when the egret is standing still or walking slowly in his relaxed gait, you cannot see the exquisite special feathers lurking among the others. 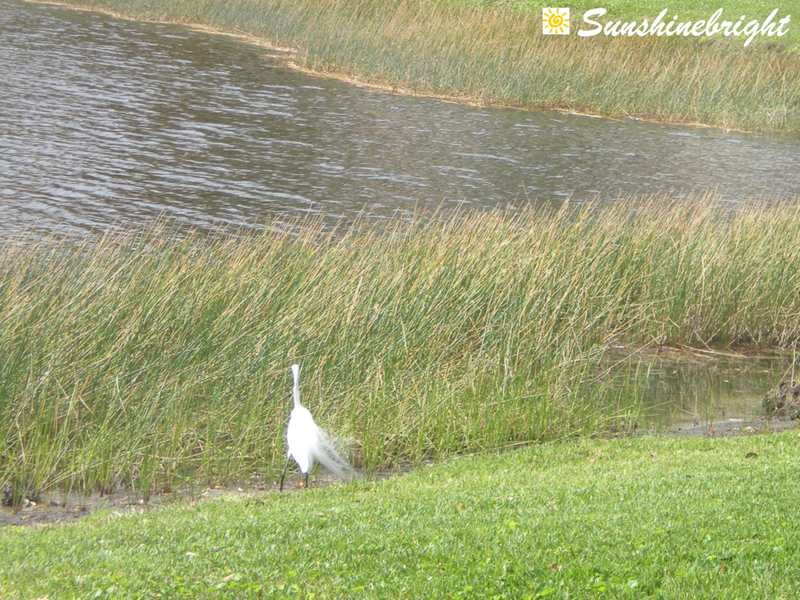 The breeze moves them and we are given some eye candy: hidden feathers caught up by that stirred wind. The breeze was getting stronger, and you can easily see the forward movement of the littoral grasses.